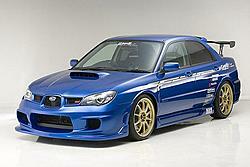 Subaru could make the most gorgeous car in the world and you'll still have people saying its ugly. Half the people hated the bug eyes, then half hated the current 04 design, now half hate the new one. Who cares what other people think. If you like it, you like it. It could look like a damn turd with wheels for all I care. Subaru's aren't known for looks. 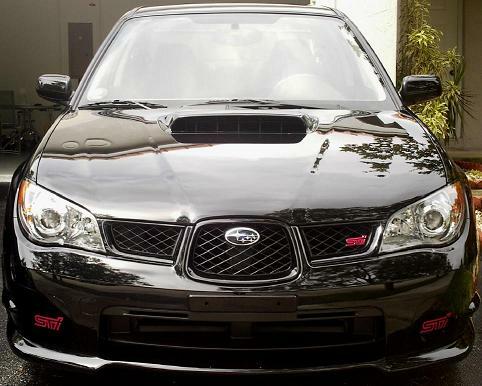 isnt the new front end supposed to look like an aircraft front end, since FUJI HEAVY INDUSTRIES started out making aircraft... IMHO i like it, i'd like it MORE if they made the front bumper a little more aggressive... but i think Ill stick to my bugeyes for now! Well unfortunately i heard from a couple of fronts (dealer, magazines, design "insiders") that the newly appointed designer really wants to incorporate the "aircraft grill" on each model in order to give them a link. This is a design process that I highly disagree with. 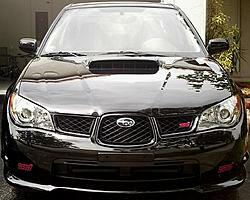 I don't want the tribeca which looks like an impreza which looks like a Forester which looks like a Legacy, etc etc etc.. The Subaru badge is enough to give every car a link. Have you ever noticed that all Dodges have the same cross-hair on the grill? What about BMW/Pontiac with their twin kidney bean grills? Have you seen a new Audi/VW? they all share a new shield design grill. Designers/marketeers like for cars of the same make to be easily identifiable as belonging to said make. (Keep in mind that these are the same people who said that Acura should drop 'Legend' and go with the nondescript 'RL', because 'Legend' was too identifiable.) 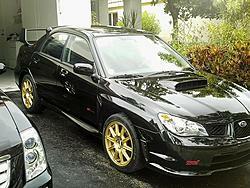 Anyways, at least both the Tribeca & new Impreza will look okay in black. Location: Are you too one of the few still living the past? Well I can change that! With a simple wicket. Yes, my friend, a wicket. PM for details. Car Info: No car right now....sob. I went and saw a bunch of the new 06s today at a Subaru dealership and I must say...The pictures do not do it justice. It looks very good...quite aggressive. I'm going to put an order in for a white one. i love the new 06s. they are so HOT in person! im gettin a Blue 1 in less than a month cant wait.. Peter Solberg said he wouldnt drive another subaru without the spoiler on top directing the airflow better. says its a major improvement. and now the 06s have a limited center slip differential now.. or somethin like that. which is a MAJOR improvement. overall the new body style is to allow better aerodynamics, and i think they did a great job. for some reason, pictures kind of ruin the car, but in person, you'll have second thoughts..
Last edited by DesertMetallicA; 09-04-2005 at 01:14 AM. Peter Solberg said he wouldnt drive another subaru without the spoiler on top directing the airflow better. says its a major improvement. and now the 06s have a limited center slip differential now.. or somethin like that. which is a MAJOR improvement..
See the thing is.. If Petter Solberg says its a big addition, it has to be a good one right? Well, the thing is a lot of us (including me) can't fully appreciate those types of improvements unless you are taking turns at a very high rate of speed or racing. Most of us are NOT professional touring car or professional rally drivers like Petter or Tommi. Most likely you won't really feel a thing. Here's mine!! And the less people that like them the better I say!! Less competition..
Now THAT looks ok. If the body kits ever come out.